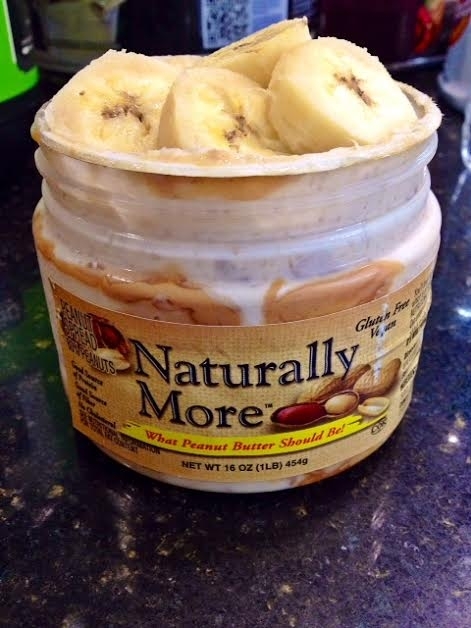 Getting low on your peanut butter jar? Overnight Oats to the rescue! All of your sweet, savory, sticky favorites in one delicious location! Once you have roughly 1/2 Tsbp left in your peanut butter jar, mix in 1/2 cup pre-cooked quick cooking oats, 1/4 cup plain Greek yogurt, 1/2 scoop peanut butter protein powder and a splash of water to desired consistency. Top with 50g overripe bananas and store in the fridge overnight! Add a little more water before eating to fluff and enjoy!